Santa Monica Press, 9781595800947, 496pp. For over fifty years, the American Film Institute has flourished as one of America's great cultural entities. Its graduates, faculty, supporters, and trustees have included such acclaimed individuals as Steven Spielberg, Maya Angelou, Gregory Peck, Meryl Streep, Les Moonves, Patty Jenkins, David Lynch, Jane Fonda, Edward James Olmos, Shonda Rhimes, James L. Brooks, Michael Nesmith, Sir Howard Stringer, and many other respected leaders in the worlds of film, television, digital media, and philanthropy. 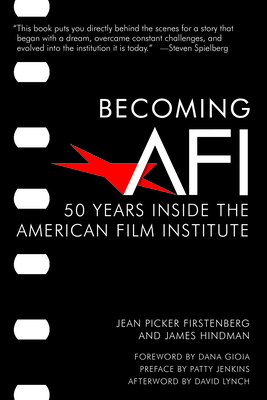 Written in a unique memoir style, Becoming AFI: 50 Years Inside the American Film Institute offers a candid look at how this remarkable organization has brought together aspiring filmmakers, outstanding educators, and visionary artists. The book details AFI's journey to becoming the foremost national champion for moving images as a vibrant art form and a critical component of America's cultural history. AFI's story is chronicled through in-depth essays written by those who have been involved in its adventures, growth, and successes: from its early years under George Stevens Jr.'s direction at the legendary Greystone mansion and the Kennedy Center in Washington, DC; through its period of incredible growth, under Jean Picker Firstenberg's guidance, as an influential cultural institution at its landmark Hollywood campus; to its continued years of excellence under Bob Gazzale's dynamic leadership. Becoming AFI provides an insightful, behind-the-scenes look at how AFI--with passionate determination--overcame the hurdles of advancing technology, political shifts, and new audience dynamics to turn its aspirations into a substantial and highly successful organization. A tireless advocate of moving images as one of America's most popular art forms, AFI is maturing into one of the world's most respected educational and cultural institutions.